Our cool weather that is lingering long has at least one benefit - the peony blooms are lasting for more time. I don't remember seeing so many bundles of them in the store before. Late one afternoon I took some time to photograph the ones left from last week's baby shower. They are just so pretty, all layers and ruffles. In flower language the peony symbolizes secrets because small fairies were said to be able to hide inside the overlapping petals. Outside, my peony blossoms were torn into shreds today by a constant strong wind that danced wildly with treetops and flowers alike. A couple of tight buds survived and I hope they open. Perhaps the wind is blowing in warmer, sunnier weather. We would all welcome it. We had to bring some peonies in after the heavy rains, too. The bird bath crashed over and took out 3 stalks with lovely white blooms and pushed their faces in the dirty. A little cleaning up and now they sit in a lovely vase, sharing their beauty and heavenly fragrance. Always enjoy your mosaics, Lorrie. 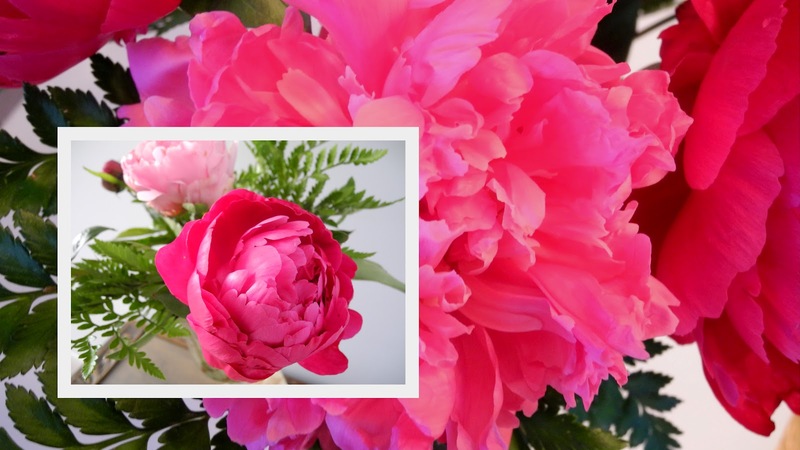 I compliment you on the composition of your peony photos today Lorrie. We've had so much rain this year that my transplanted peony is a foot or so above ground and time will tell if it will bloom or not. I sure hope so. I think I may have to drive up into the peninsula this week and look for a roadside stand with peonies. I'm longing for an armful. What a lovely and romantic post..peonies will bring that out in us! Your top photo could hang on the wall; it's lovely. Peonies are my favorite flowers. Those, and the little yellow ball-shaped flowers that look like they came from Dr. Seuss. What a nice combination of elements in your first picture. My peonies haven't even opened yet. It's been too cold and dark and wet. We are going to have three days of warmer weather, so I expect everything in the garden will finally get a move on and flower. About time. My mom used to point out that one could always count on a rainstorm when the peonies were blooming. I really like how you displayed one bloom on the sheet of music; it's a striking image. I like to think of the fairies hiding in the big blooms. I hope they all survived the wind and you are enjoying a sunny day! Hugs! Big thanks for the comment . I was happily surprised . Gorgeous peonies! I just bought some from Trader Joe's that were the same color but by the time I got home they had wilted and didn't come back. I'm going to do a painting of them anyway! Peonies are a favourite of mine! Love the rich colour in yours, it's so beautiful.